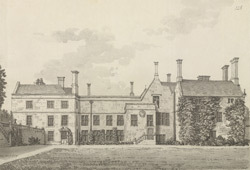 A west view of Annesley Hall, which was built in the 17th century by the Chaworth family, who made Annesley their home until their line ended in 1790. White's Directory of 1853 reports that Annesley Hall, "the seat of Captain Phillip Hammond, is a large ancient mansion, surrounded by a fine park, well stocked with deer and extensive woods". The centre part of the house was built in two stages between the mid- and late-17th century.